The citywide campaign recently kicked off its second phase. South Philly is slowly solarizing. In April, the campaign launched its second phase, as nearly 500 homeowners have already expressed interest in the energy-saving panels this time around. Although kicking off in 2010, Solarize Philly picked up momentum in 2016 after the Philadelphia Energy Campaign leveraged $1 billion toward energy efficiency and clean energy throughout the city over the next decade, which would also create 10,000 living wage jobs around the region. Along with fostering sustainability, the Solarize Philly’s mission is coupled with job cultivation. “Everything we do really is through that lens — firmly looking through energy as a tool for economic development for the city,” Vila said. 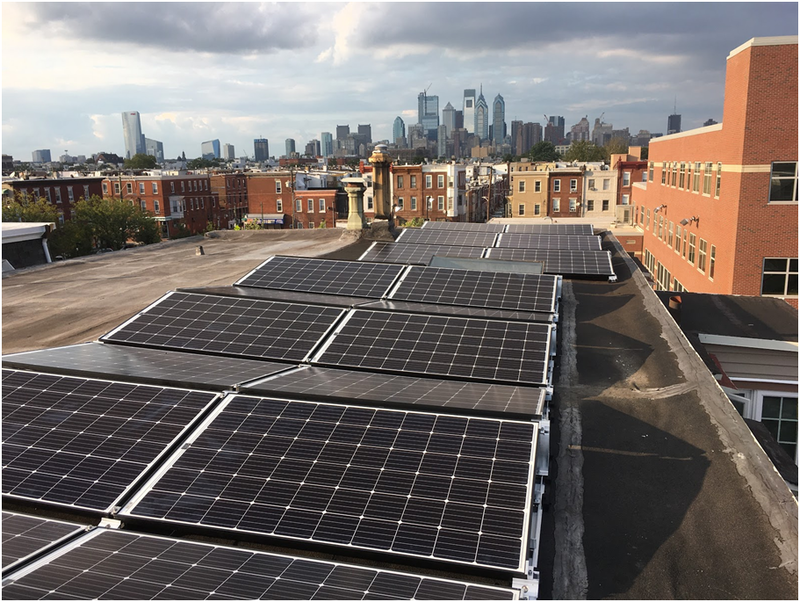 In April of last year, Solarize Philly launched its first phase in which $3 million was invested in 885 kW of rooftop solar energy. Nearly 2,200 signed up for the system and 186 signed contracts were made official. In 2017 alone, the city’s solar market grew by 46 percent — the fifth-largest growing market in the country, according to consumer centric source OhmHome. “There was a big untapped demand for solar in the city,” Vila said. Another major benefit, nearly 27 new jobs were directly made in the city since phase 1 — half of which went to minorities or women. Along the lines of career creation, the campaign concurrently conducts job training for Philadelphia students, partnering with School District Career and Technical Education for full training programs related to solar installation. One job is created for every 15 resident solar installations, according to Vila. In fact, solar panel installation is currently the fastest-growing occupation in U.S. with an expected 105 percent growth through 2026, according to the Bureau of Labor Statistics. Of course, solar energy helps to satisfy environmental concerns, as well. In harnessing the sun’s immense light and heat, homeowners would simultaneously see decreases in electricity bills. “Not only are you drawing power from the grid, you’re pushing power back into the grid,” Vila said. Vila says monthly bills would simply be that net difference. Savings on electric bills average a couple hundred dollars a month. Depending upon roof size and the amount of energy used per month, prospective photovoltaic solar panels can cost between $10,000 and $20,000. Considering Solarize Philly centers on group buying, discounts are based on the number of contracts signed. The more people who sign up, the steeper the discounts. Based on outcome, each installer will issue rebate checks to their customers at the end of phase 2, which is scheduled for July 21. Payments can be made through through cash or a home equity loan, as buyers can receive 30 percent of their investment back with the federal investment tax credit through 2019. For this phase, Solarize Philly is piloting a financial plan, aiming to draw at least 45 homes. The requirements include no registration on PECO’s Customer Assistance Program and all PECO bills must have been paid on time and in full over the past year. Residents must have their name on the deed of the house, as well as a roof less than 5 years old. The “break even” rate for the system averages about eight to 10 years. LoMo residents expressed interest in the systems, inquiring about the panels’ durability with weather and their overall efficiencies over time. Most panels will last up to 30 years. As for the first 25, they will degrade no more than 10 percent of their year one efficiency, according to Matt Brill of Solar States — one of Solarize Philly’s installers. Brill also says the panels can withstand all weather, including up to 125 mph winds. They also act as a protectant for roofs. “It’s engineered to take all that nature can hit it with,” he said. Solarizing seems to spark a community effect, as Vila says the alternative energy is most concentrated in areas already acclimated to the system. For more information on Solarize Philly or how to invest in solar panels, contact the Philadelphia Energy Authority at (215) 686–4483, email solarize@philaenergy.org or visit http://solarizephilly.org/.